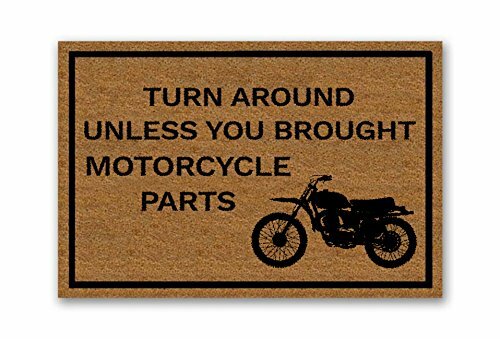 » OVERVIEW: This funny welcome mat is perfect for all of you motorcycle lovers out there! Welcome your guests and have them smiling cheek to cheek with a funny doormat. It even works for the entry to your motorcycle garage! » PERFECT SIZE: Clean off your shoes on this durable, 18×30 inch coir doormat to keep the dust and dirt out and the motorcycle parts in! » HIGH QUALITY: We love our quality just as much as you love riding motorcycles, so we built this incredible indoor/outdoor mat to last from the strong and durable husks of coconuts. Plus, this motorcycle welcome mat is even vinyl-backed, creating an adhesive grip to your floor. » EASY TO CLEAN: Cleaning is as simple as a 1-kicker, just shake, sweep, and vacuum! Buy this cute doormat to make cleaning shoes and entertaining friends and family way more fun!